I hope everyone had an enjoyable summer. If you are looking for a math tutor this school year now is a good time to sign up as spots fill up quickly! Don't wait to fall behind but rather get a good running head start to succeed in math this year. Whether you are taking PreAlgebra, Algebra 1, Geometry, Algebra 2, Trigonometry, or Precalculus I'm here to help. I have worked with students in the Rochester, Rochester Hills, and Oakland Township areas for many years and am familiar with the curriculum, schools, and families. Oftentimes I'm working with students that are in the same class as your son or daughter. Let me know if you have questions about my tutoring I'm happy to answer them. Generally I cater the session to what your student needs, however most sessions follow a basic format of first asking if there are any questions or things they would like to discuss. We spend some time reviewing recent topics and also previewing upcoming topics so students will be prepared. We also are constantly prepping for upcoming quizzes and tests by simulating a test taking experience. What I feel sets me apart from some other tutors is that I have lots of experience tutoring these math subjects and am familiar with the textbooks and curriculums. Also, I take a very positive and encouraging approach which makes students feel comfortable working with me and they can get more out of the sessions. Furthermore I tutor math full time so I'm very current with what is going on in the classes from working with many students in the same school and oftentimes even having the same teacher as your child. Lastly, I enjoy helping students succeed and look forward to helping your student! Be strategic! 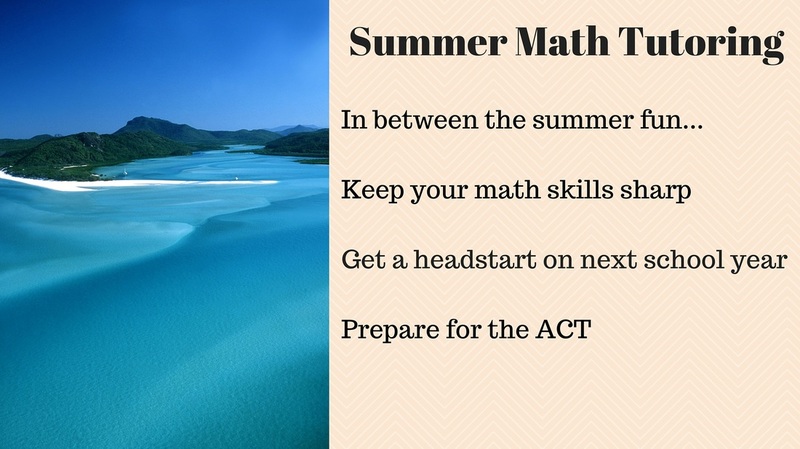 Enjoy the summer but fit in some SAT math practice. I recommend you take 1 day per week for the month of July and take an official practice test. The math is composed of 2 sections one calculator the other without. Total time commitment is 1 hour 20 minutes per test for the math. Take it Monday morning then take the rest of the week off! Then take another one the following Monday until you have taken all 4 official practice tests. I know I know I know...your on vacation, right?! Sometimes its the little things that can make a big difference....this is one of those things. If you want help going over the ones you missed give me a call. Here is the link to the 4 official SAT practice tests...do your best, time yourself, and learn from your mistakes. A new addition to the website! I've been producing some free math videos to help students with concepts that I'm frequently asked about. I've been mainly working on PreCalculus and Algebra 2 topics recently. Have your student check back periodically if there is something they are not understanding in their class or let me know and I can add that one to the list. Also, please excuse my beginner level video production. I'm aiming to improve as I get experience and add additional tutorials. The videos have everything one needs to learn but Hollywood hasn't called yet. Keep on studying and good luck with finals this week! One thing that I have noticed about many of the students I work with is how they go through stages. At first, students can often be very tentative, shy, and unsure of themselves. They don't know what to work on, what questions they have, or why they are even getting tutored. I'll ask them something like, "Do you have any questions?" and they'll say "no, I pretty much get it"...which doesn't match up with the "C" they just got on their last test. After students work with me for a few sessions they start to get more comfortable and start asking questions. As more time passes they start taking more and more responsibility for their math success and have an idea for what they would like to work on in a given session. Eventually, many students take complete ownership of their tutoring and they want to get the most out of their sessions as possible. When I arrive they have their book and materials out, a list of questions and topics they want to work on and in what order, and are ready to dive in and get to work. They actively take charge of their learning: making notes to themselves, tackling difficult problems, skipping parts they already understand and they have a laser like focus. Students are getting something even more important than just a better grade or math knowledge out of the sessions. They are learning to be mature self-directed adults. It's great to witness their increased confidence and the skills they are learning will serve them well in college and beyond. A few days ago I met with a new student and within a short time of beginning the session she made it a point to tell me "I'm really good at other things, but math I struggle with." I find this really interesting and hear similar things from other students and parents as well. "Johnny is very intelligent but he doesn't put in enough time on his homework." Or, "Kelly is really bright but she has a personality conflict with her teacher." And sometimes in trying to break the ice with a student and lighten up the session I ask students if they play sports or do other extracurriculars. Come to find out, they tell me that not only do they play football but they are the quarterback(an important position). Or, not only are they on the cheer team but they are the captain(important). Or still yet, they are a leader on student government(important). What I believe all these students(and parents) want is to be respected, treated with dignity, and seen in a positive light. They don't want to be talked down to, judged negatively, or receive inferior treatment or inferior tutoring. One of the reasons I feel that I am effective with the students that I tutor is because I really understand and "get this." I treat my students with kindness, patience, encouragement, positivity, respect and dignity. I believe in students' capacity to learn and improve and I recognize that outside of their math class, regardless of their math ability, they have amazing talents and skills and are important as people. Students pick up on the way they are being treated immediately and they either shut down or they are receptive to the assistance that I am offering. I never try to pretend to be a certain way because young people especially know if they are dealing with a phony. Math is one of those core classes that often requires more time and effort than some others and I understand how it can be challenging. I got my official start in tutoring working for a retired 30-year Detroit Public School teacher. I asked her once what was her secret and what she told me resonated with me and I never forgot: "When students do something correctly praise them to the moon!" She was a super positive lady and her students felt good about themselves and they did well. I've been able to make a similar positive impact on a number of students over the years. One in particular goes back maybe 8-10 years now and about once a year I bump into this student's mother in the grocery store. She always tells me how I really helped her son's confidence. He's long graduated from college and is pursuing his dream of being a filmmaker out in California. As you can imagine, events like these keep me going and reinforce my belief that if you believe in people you create the environment for better learning and even other positive qualities such as better self esteem and self confidence. When you play a sport you're aggressive, right? Why not be as aggressive with your math? Of course, we are talking about a positive form of aggressiveness where you aren't sitting watching on the sidelines but rather chomping at the bit to get in the game. Let me ask you a question: When you are in your class are you leaning against the back of your chair with your arms folded and your pencil lying on your desk?...or are you leaning forward with your pencil in hand actively involved? When you are doing story problems you should be filling up your paper with diagrams, equations, notes and sentences with intensity! When I was in college, I was told that when taking a test if I happened to drop my pencil that the students sitting next to me would kick it across the room. The tests were graded on a curve and everyone wanted an advantage over one another. This, of course, is not the aggressiveness we are going for. By the way, this never actually occurred but gives you an idea of how competitive you should be with yourself. You know that final lap your track coach makes you do before practice is officially over? Or the last 10 push ups and 20 sit-ups before your football practice is dismissed? Likewise, you want to be doing one more challenging word problem, asking one last question, and proving one last theorem. I've got to tell you a secret. I wasn't the smartest kid in my classes but I worked at school harder than my average classmate. Oftentimes things didn't "click" until that 5th or 10th time...but once I got it - I really got it. Occasionally I come across a student that absolutely has a bad relationship with math. They don't believe they are capable of being good at math, they don't see the point in it, and they don't want to try and understand it. Aha! Problem solved, or shall I say semi-solved. To make a long story shorter, I could try and teach, assist, and tutor this individual but without an internal shift my efforts would continue to be largely rejected. My suggestions to a student and family such as this would be to first work on changing the student's relationship with math to more of a friendly one. Second, there is talk these days of 'helicopter' parents. These are parents that are continually 'hovering' over their children too closely making sure all their i's are dotted and t's crossed, etc. There needs to be a shift in responsibility and accountability from the parent to the child. It may take some time but the parents need to empower the students to be more self accountable, self responsible, and to take pride in their own efforts to learn and manage their time and studying. As a tutor, I aim to provide good quality instruction in a positive reinforcing manner. When I see obstacles to learning that go beyond just understanding math concepts I will tactfully mention these to parents. I always try to take a positive approach but some aspects of learning go beyond what I can personally provide. I know of one tutor that won't tutor students unless the parents agree to make sure the students get 8 1/2 hours of sleep minimum per night otherwise he won't continue helping them. I haven't gotten this strict(...yet : ) ) but I do think it's important to continually look at all the factors that contribute to successful learning. So, in conclusion, first check in with your child and see how they feel about math and their math class. Second, see if they are taking an active role in their own learning. Thirdly, look for other obstacles to successful learning such as lack of sleep, etc. Then allow tutoring to build on this excellent foundation.